Are Amusing Traffic Signs More Effective? Roadway safety signs have traditional been predictably mundane. However, some states are shaking things up by telling the same old messages in new and more endearing ways. State roadways authorities in Iowa and Utah, for example, have begun some creative new initiatives to get their points across more effectively. Many drivers are no doubt grateful for the break from the monotony of traditional warnings like “Fasten Seatbelt” or “Road work ahead”. This new generation of signs pulls on a wide variety of sources to offer some humor to drivers while also raising awareness. 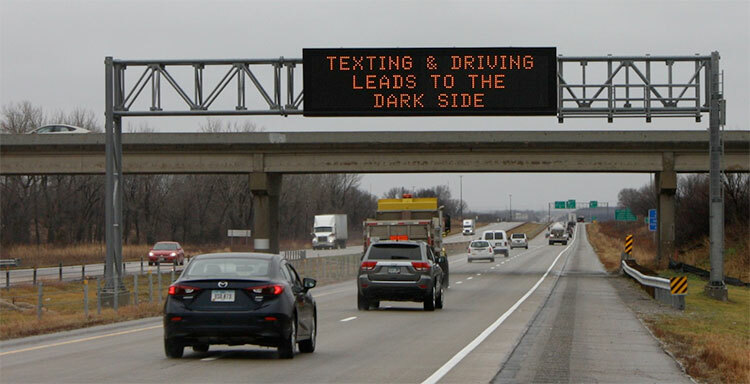 Pop culture has been one important source of inspiration used by the Iowa Department of Transportation in its “Message Monday” campaign to post eye-catching warning signs. The Department made a reference to “Star Wars Day” last May 4th with a sign saying, “May the 4th be with you. Text I will not“. Sometimes, Iowa’s clever new signs even touch upon a bit of vulgar humor, as in the case of a recent sign reading “Get your head out of your apps“. In the state of Utah, highway authorities have come up with some clever witticisms like “Turn signals: the original instant message“. Areas of the country where a strong regional dialect is present have attempted to appeal to drivers through dialect. For example, recent signs around Massachusetts have read “Use yah blinkah” and “Make yah ma proud, wear yah seatbelt.” Massachusetts has also used seasonal warning signs saying things like “Don’t be a grinch, drive safely” or “Texting will get you on the naughty list“. Roadway signs with creative ways of relaying the message can address just about every possible safety issue out on the roads. Typically, they encourage the driver to slow down, put a seatbelt on, or avoid using a cell phone while driving. However, they can also be used to warn of construction work ahead. Highway authorities are taking on new initiatives like the “Message Monday” campaign in Iowa under the assumption that drivers will pay more attention if there is some amusement value to signs. When stuck in rush hour traffic, for example, the average driver is eager for some comic relief. Clever or funny roadway signs capitalize on the sense of humor of drivers and their appreciation of a bit of camaraderie out on the roads. Observers often wonder that highway authorities in various states are permitted to stray from the norm when it comes to posting warning signs. Roadway signs must follow guidelines set for by the Manual of Uniform Traffic Control Devices that is set forth by the Federal Highway Administration. The specifications set forth by MUTCD leave a lot of room for creativity. Guidelines simply dictate a set of federal standards regarding the visibility and location of signs. States even enjoy free rein to set their own standards if they so desire. Conclusive research studies indicating whether or not these new roadway signs are more effective than more straightforward road signs is hard to find. However, it’s worth noting that the number fatalities in roadway accidents in Iowa did go down in the years since the “Message Monday” initiative was adopted. While there were 365 road deaths in Iowa in 2012, there were only 317 and 321 in 2013 and 2014, respectively. Drivers interested in learning more about what roadway authorities like the Iowa Department of Transportation are doing to boost safety out on the road can take a defensive driving course. Traffic school courses focusing on defensive driving teach drivers to take in their surroundings and stay constantly vigilant of what’s happening out on the road. They also endeavor to keep students engaged in educational content about driving safely, just like these clever new roadway signs.